On a cool afternoon in Cincinnati Ohio I have decided to start a blog. I did some reading on how to do this and the common theme seems to be to have a format and to blog about something your passionate about. Well, I am passionate about baseball and absolutely love to talk about it. This is something I've thought about in the past but today I decided to just go for it. Welcome to Striking Out The Side! I will post about games, players, teams, milestones, cards, events, and random topics about the game. My name is David. I live in Cincinnati. By default I am a Reds fan. 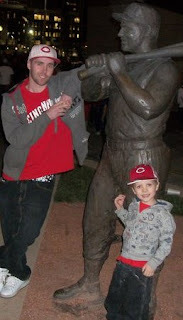 I was raised a Reds fan so heritage is strong with me here. There are other teams I like but all an all I love the game of baseball. I have favorite players like anyone else. I have a girlfriend, 2 young boys and work full time doing nothing you'd consider awesome. I enjoy collecting cards and attending signing events. I have a "mancave" like a lot of die-hard sports fans and enjoy my expensive hobby no matter how much my wallet cries. My boys are currently 6 & 10. My 10 year old plays baseball and loves playing it. Like many kids though, he gets bored watching it. He doesn't know of many players outside of the reds or the ones I talk about. As for my 6 year old, he has no interest in athletics at all. I've tried playing ball with him and he just doesn't seem coordinated. He gets frustrated quickly and that's about it once he gets upset. Once he is done, the show is over. That's about it for me today. I'm going to try to fine tune this blogger account and make sure the website in synched up correctly now. Go Reds!! !